South Africa and Nigeria set Group E alive with 10 goals between them in their heavy victories. 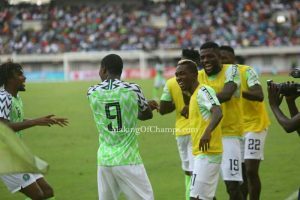 South Africa mauled Seychelles 6-0 at home while an Odion Ighalo hattrick inspired Nigeria to a 4-0 drubbing of Libya. The Bafana Bafana lead the group with 7 points, followed by Nigeria with 6. Zimbabwe are riding high in Group G following their impressive 1-2 win away to DR Congo. The win takes them above the Congolese to 7 points while DR. Congo remain 2nd with 4, leveled with Congo Brazzaville who beat Liberia 3-1 on Thursday with Liberia President and former captain George Weah watching on. In Group K, 2012 champions Zambia have dropped to the bottom of the group after they beat Guinea Bissau 2-1 on Thursday before losing the reverse by the same scoreline on Sunday.